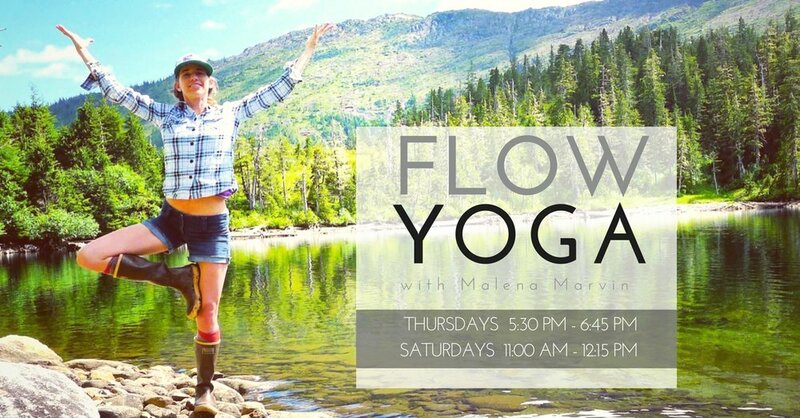 Join Malena Marvin for a flowing sequence of yoga poses to build strength, mindfulness and flexibility. Classes are rooted in a vinyasa flow, emphasize breath-centered practice, and are tailored to suit the needs of current students. All levels welcome! Caution: Yoga has been shown to decrease blood pressure, boost immunity, improve sleep, increase flexibility, reduce anxiety, and prevent aches and pain. Bring your mat, blanket, block & strap - or use ours. $12 drop in, $30 for 3-class pass, $90 for 10-class pass. Kids 15 and under and veterans half-price. No one turned away for lack of funds. Join the Petersburg Yoga group on Facebook for updates on subs, visiting teachers, and special workshops. Instructor Malena Marvin has taught yoga to K-12 public school kids, on wilderness expeditions, and worked with teen girls on the Art of Yoga project. She began her yoga practice in 1996 and has completed a 200 vinyasa teacher training. A strong believer in holistic health, she has completed over 200 hours of training in Thai Bodywork. Caution: Yoga has been shown to decrease blood pressure, boost immunity, improve sleep, increase flexibility, reduce anxiety, and prevent aches and pains. Come to breathe, stretch and build community during your pregnancy. The class will cater towards the individual mother's needs, using props and variations to make sure you are comfortable and safe in each pose. Breath and mindfulness techniques will be used to help find physical and emotional balance along your pregnancy journey. Every Wednesday from 5:30-6:30 starting August 9. $7 drop in fee, runs through Sept 20.